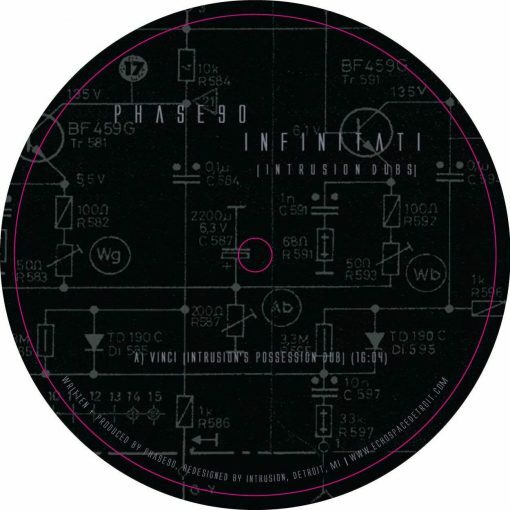 We’re proud to announce Intrusion (cv313/echospace) reworks of Phase90’s, “Infinitati” an album Boomkat hailed as, “a place to dip your toes in Deepchord/Echospace’s oceans of sound, this is it.” A night time walk on the wrong side of the street, creepy and ominous in nature as a result of the possessive quality of supernatural textures, field recordings and found sounds conducted at the Calvary Cemetery. Utilizing the original 1/4″ tape recordings and individual sounds, Intrusion builds on the foundation steps further, using the mixing board as the primary instrument as well as, tape splicing, 12 bit loop stations and other audio wizardry. The material on this 12″ ep can be interpreted as sinistral–dark,, heavy due to the hardware and its currencies emitted by its source–the phase 90. An acidic dream residing somewhere in the ether. Absolutely essential listening and horizontal grooving for the ages! More items from " Echospace "
More items from " Phase90 "